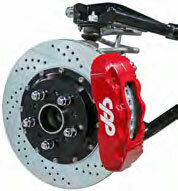 The 6 piston calipers are a 2-piece forged caliper design with six cross bolts for added strength. The piston sizes are staggered to minimize tapered pad wear and it uses the same pad as the C5 (1997-2004) and C6 (2005-2012) Corvette for an easy-to-find, cost effective pad replacement. Includes stainless steel pistons, abutments, noise suppression springs and dual seals (dust/weather pressure) to meet DOT specifications. Kits come with proper banjo fittings, not pipe thread fittings. Available for stock, Modular, X-10 Xtreme and CS Corvette-style spindles. Available with black or red calipers. KITS FEATURE: * Contents may vary between applications. 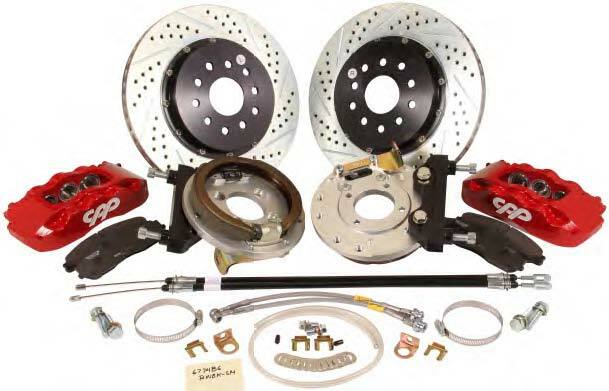 Rear kits also available with 6 piston calipers. Rear calipers have the exact same look as the front. 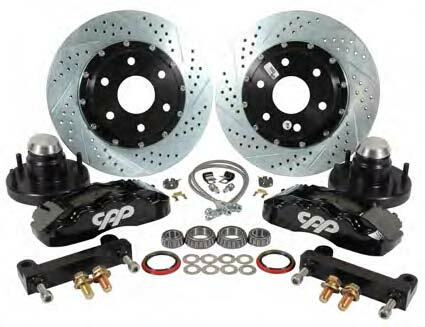 Rear calipers are machined specifically for rear applications and have smaller, yet staggered pistons to minimize pad taper. Rear kits incorporate a drum in hat park brake. Kits come with proper banjo fittings, not pipe thread fittings. Available with black or red calipers.